Everyone has a different passion in themselves. a passion will greatly affect one’s life. However, there are some who want to fight for their passion and some who ignore it. One passion that is very unique and not shared by everyone is the desire to write. For some people, writing creative writings such as fiction, novels, or poetry is difficult, but for people who have passion in the field, writing is an activity that is very exciting and will make the person satisfied when he can produce a work. Especially if the work can be enjoyed by everyone in this world. Great writers are all over the world, one of them is Russia. it’s no secret, Russia has a myriad of the best literary works from the creative thinking of the writers. Some are in the form of novels, poems, fiction, or books. Great Russian writers have always managed to give different touches that characterize their works. the stories they write, words, atmosphere, and also the mandate in each of their works are so unique and amazing. Not surprisingly, if the works of the great Russian writers become a reference for lovers of literature throughout the world. Because of the uniqueness and success of their works, there are many films and television series that adopt stories from the works of famous Russian writers. like the Anna Karenina novel which was filmed with the same title and is considered the best novel of all time. Besides that, there is Doctor Zhivago, First love and many more. Then, who is the great writer who succeeded in making this legendary work? Here are 5 freaking great russian authors you must read. The first great Russian author we will discuss is Leo Tolstoy. Almost all literary lovers know him. Tolstoy was one of the literary giants of 19th century Russia. Leo Tolstoy is a Russian writer born on September 9, 1828 at Yasnaya Polyana, Russian Empire. His birth name is Lev Nikolayevich Tolstoy. He is a novelist, short story writer, drama and essayist. He has a wife, Sophia Tolstaya and 14 children. He began writing from 1852 to 1910. 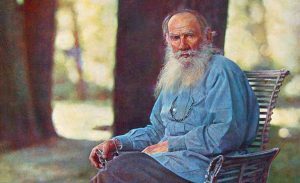 Leo Tolstoy died on November 20, 1910 in Astapovo, the Russian Empire at the age of 82 years. Besides Russian, he also mastered French. Leo Tolstoy produced many works that were highly admired by the world. among his works, the most famous are War And Peace, Anna Karenina, A Confession, The Death of Ivan Ilyich, and The Kingdom of God Is Within You. He is widely regarded as a great novelist because of his works War and Peace and Anna Karenina. War And Peace is the first novel released in 1865-1867 and is a tetralogy novel. This novel was written by Leo Tolstoy on July 1805 in Saint Petersburg with 1,225 pages. This novel tells the history of the French invasion of Russia and the impact of the Napoleonic era on the Tsarist community through the stories of five Russian noble families. Then, another great work is Anna Karenina. Anna Karenina was Leo Tolstoy’s masterpiece published in 1877. The novel tells the story of Anna Karenina’s affair with Vronsky, a brave military man. This novel is very famous and has been adopted as a film of the same name. Leo Tolstoy is a really great writer! Aleksandr Pushkin is a great Russian writer born in Moscow, the Russian Empire on June 6, 1799. He is a poet, novelist and playwright. Just like Leo Tolstoy, Pushkin also mastered Russian and French. He has a wife, Natalia Pushkina and 4 children, Maria, Alexander, Grigory, and Natalia. Pushkin published his first work, a poem at the age of 15. Great! Aleksandr Pushkin produces many works such as poetry, novels, short stories, and non-fiction prose. His famous works include Eugene Onegin, a novel, a Ruslan I Lyudmila And Ludmila poem, and a poem that is considered to have the most beautiful love lyrics ever, K.A.P Kern To A.P. Kern. His great works are still a reference for literary lovers around the world. compared to the novel, Aleksandr Pushkin wrote more poetry. And he has written and published it since he was 15 years old. Extraordinary! Pushkin died on February 10, 1837 at the age of 37 at St. Petersburg, Russian Empire. a lot of controversy about his death. This great Russian author who was born on 11 November 1821 has the full name of Fyodor Mikhailovich Dostoyevsky. He is a writer with works that influence 20th century Russian literature. The hallmark of his work is that it often displays characters in a state of extreme despair and thought. So as to show an extraordinary understanding of human psychology as well as in-depth analysis of politics, social and spiritual in Russia. Dostoevsky was arrested and detained on April 23, 1849 for being involved in revolutionary activities against Tsar Nikolai I and almost sentenced to death. There are many works that influence many world writers. among them are Poor Folk, The House of the Dead, The Gambler, The Idiot, and Crime And Punishment. He also wrote many short stories such as White Nights, A Honest Thief, The Peasant Marey, and A Christmas Tree And A Wedding. When you read a variety of his works, you certainly admit that most of his work describes human psychology. In addition, he also described the political, social and religious situation in Russia at that time. However, he stopped producing other beautiful works, he died on February 9, 1881. The next great Russian writer was Anton Chekhov who was born on January 29, 1860 and died on July 15, 1904. Chekhov was better known in modern Russia because of his hundreds of short stories and plays which had a profound influence on 20th century drama. His most famous works include the drama Three Sisters, The Cherry Orchard, Uncle Vanya, and The Worthless Fellow Platonov. He also wrote many non-fiction writings such as Travel to Sakhalin and short stories such as Lights, The Princess, At Home, The Beggar, A Work of Art, and many more. And he once wrote a novel called The Shooting Party. The last great Russian writer we discussed in this article is Ivan Turgenev. Do you know the Fathers And Sons novels and First Love? Yes, that is a small part of it. Turgenev was born on November 9, 1818 and died on September 3, 1883 at the age of 64. He is a Russian novelist and playwright. His most famous work was Fathers And Sons, published in 1862. A novel with a beautiful structure in a 19th-century novel. Turgenev beautifully described the revolutionary doctrines which at that time began to spread in Russia. And he also produced several short stories filled with psychological analysis, such as Spring Flow, Asia, and First Love. First Love has been adopted as a successful film. Through writing, the authors poured all their ideas and creativity totally. They are very easy to combine a variety of beautiful words that make anyone who reads it will be fascinated. The great Russian writers above have proven it with their extraordinary works. Those are 5 freaking great russian authors you must read. If you are a true lover of literature, you should read the masterpieces of great Russian authors. their works have been referred to today. In fact, many of their writings have become successful films, how can you miss them?